ABOVE: Pens to Pictures pictured at Dayton Correctional Institution. BELOW: Chinonye Chukwu offering advice with a student. Photography Credit: Will Jones, courtesy of Wright State University. During the early stages of curating INCARCERATION, a friend introduced me to a pioneering new project that seemed to match the very essence of issue.3. 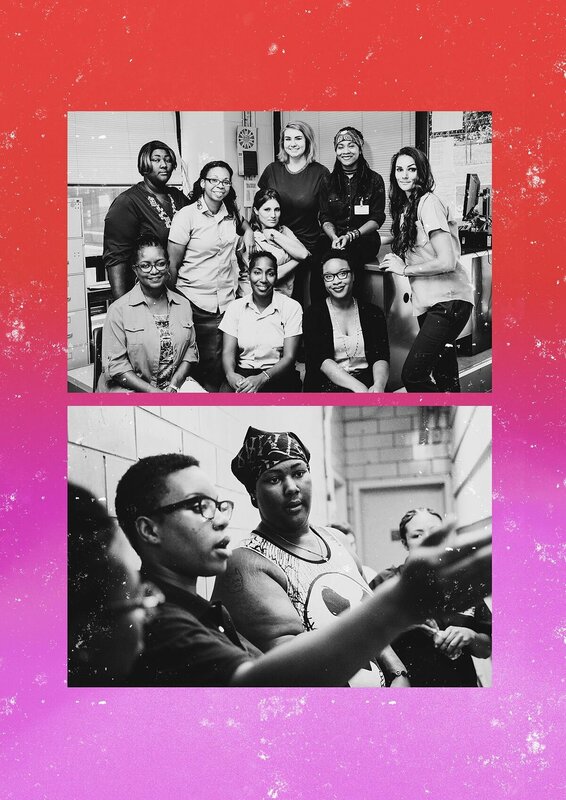 Pens to Pictures is a filmmaking collaborative seeking to teach and empower incarcerated women to make their own short films, from script to screen. Conceptualized in 2015 and officially getting off the ground the following year, the project has since released five films and have been programmed in a multitude of venues including prisons, festivals, and prestigious art spaces such as Wexner Center for the Arts in Columbus, Ohio. Made in partnership with artists and film students around the Ohio Valley and the women in Dayton Correctional Institution (DCI), the ongoing collaborative effort has proved itself successful at unifying the moving image with the empowerment of imprisoned women through their own art. Created by Wright State University professor and filmmaker Chinonye Chukwu, the multi-talented Nigerian trailblazer is also the recipient of the prestigious Princess Grace Award and Princeton Hodder Fellowship. Chukwu would begin each film lesson with a affirmation, deliberately easing the mood of a environment pulsating in confinement and with the goal to strengthen a growing skill set and confidence that tends to get chipped away when locked up. Once identifying the undeniable power circulating around Pens to Pictures, it was vital to highlight the group but the original interview had to be reworked once Chukwu’s feature screenplay, Clemency was picked up and immediately set to shoot. As Chukwu is busy working on her film centering on a prison warden confronting her psychological demons and starring the incomparable Alfre Woodard, it was still of the utmost importance for us to spotlight Pens to Pictures especially with the great hope that Chukwu is hoping to spread the Midwestern bred organization around the country. Pens to Pictures featured on a local tv station. Expand the advocacy work around mass incarceration to more intentionally include women and girls. Provide local area student artists and community professionals the opportunity to further cultivate their craft and connect it to social justice advocacy. Collaborate with organizations and individuals on their advocacy work to end mass incarceration. Teach incarcerated women new skill sets that will help in future career opportunities upon reentry. Expand societal consciousness around incarcerated populations and the systemic oppressions that can contribute to their incarceration. Empower incarcerated women to tell their own stories. List of short films written and produced through Pens to Pictures that was released in 2017. We’re excited to see what 2018 and beyond have to offer! BANG! (Kamisha Thomas) portrays a woman with two starving children who has been rejected by nearly everyone and pushed to her limit. Love or Loyalty (Tyra Patterson) examines the bonds formed between women in prison. TransParent (Jamie Ochs) explores the complicated relationship between a mother and daughter. The Devastating Game (Beverly Fears) examines the psychological and emotional complexities of sexual abuse. For They Know Not (Aimee Wissman) chronicles a woman’s battle with heroin addiction. Pens to Pictures slate of films have been exhibited at prisons, college campuses, community spaces, libraries, festivals and more. They’ve also held creative workshops alongside screenings to drive home their mission of advocacy and collaboration with like-minded organizations. Screenwriting bootcamps in juvenile detention centers. Legal clinics for abuse survivors, in collaboration with nonprofit organizations. Health fairs for formerly incarcerated women. Editor’s Note: The following information is sourced from the official website of Pens to Pictures which you can browse and learn more about at www.penstopictures.org.